the addition of presentation feature to its Google Docs suite. It had to happen sooner or later. The fact that Google was working on it was already out and again discussed after Google's aquisition of Zenter, a company that provides software for creating online slide presentations. 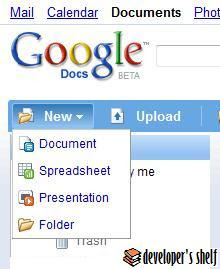 The earlier name "Google Docs & Spreadsheets" has been officially shortened to "Google Docs". You can access it via documents.google.com. Click on New menu item and you can see the new Presentation item. It is a very simple implementation for creating basic presentations although you can import PPT and PPS files. Office 2007 presentations cannot be imported as of yet. You can email, share or publish your presentation after you are done creating it. When you share it, collaborators and viewers can join, they can also subscribe to a RSS feed of the changes to the document. This is a cool feature. Revisions are maintained automatically for all edits and you can revert to any revision. I created a presentation that is published at http://docs.google.com/Present?docid=ddzhqd9r_1dfrdhz&fs=true. After you publish your presentation, you can invite people to it. You can also chat with them using the integrated Google Chat. Nice. You can access the "printable view" which will put all the slides in a web oage for you to print them at one shot. Cool. Finally, you can save the presentation as a zip file. It is a nice feature which packs a HTML file and images in a zip file. It downloads the images used in the presentation locally. This zip file can be used to run the presentation when offline. "Save as PDF" will be a welcome feature. Integration of audio/video/animation into the presentation would be a welcome feature too. Google is trying to focus on the ease of delivery of presentations rather their creation. Integration with chat, revision control, collaboration, rss feed are some of the highlights. It will be interesting to see how Microsoft responds. Here are the Top 10 benefits of PowerPoint 2007, just to keep the comparison fair.